My childhood came to a virtual halt when I was around five years old. That was when my grandfather banished my father from our lives forever for some transgression that was not to be disclosed to us children, though we overheard whispered references to bankruptcy, bootlegging, and jail time. His name was never again spoken in our presence; he just abruptly disappeared from our lives. The shame and disgrace that enveloped our family as a result of these events, along with the ensuing divorce, just about destroyed my mother. Is it possible today to make anyone understand the harsh judgment of such failures in the late 1920’s? Throughout my entire life, whenever I was asked about my father, I always said that he was dead. When he actually died I never knew. So it was that Grandma and Grandpa chose to make our family of five—Mama, my ten-year-old brother Jack, my eight year-old brother John, my one-year-old sister Avis, and me — their responsibility. They decided to settle us on the smallest of Grandpa’s four farms, which was located about three miles from the village of Garrison, where they had retired after a lifetime of farming. However, because the fierce blizzards and subzero temperatures of Iowa winters made it hazardous to walk to the one-room rural school we would be attending, it had been arranged that we would live with Grandma and Grandpa in Garrison and attend school there from January until the school year ended in mid-May. At that time our family would move out to the farm. Each year from then on, we went to school in the country from September until Christmas, then moved back to Garrison and finished the school year in town. Our new life began when we arrived at Grandma and Grandpa’s on a cold winter day in February. The house we moved into that day was a large, substantial structure. It was located about seven miles from Vinton, the seat of Benton County. Grandpa was born, raised, married, and buried all within an eight-mile radius of Garrison and Yankee Grove, the wooded area where his parents had settled as pioneers. Grandpa and Grandma must have had some unspoken, perhaps even unrecognized, resentment at having toiled all their lives raising their own family, only to be confronted with the inescapable fact that now, retired at last, they had to do the whole thing all over again and raise their daughter’s “spawn,” as Grandma often referred to us. And all of this was happening at the worst possible time, during the Depression. All three generations suffered. We kids were under the constant surveillance of Grandma and Grandpa, who were critical of how we spent our days, how we spoke and dressed, and how we behaved. (In a good many ways, they never quite made it into the twentieth century.) Suddenly we were subjected to a completely new set of rules, which governed every aspect of our lives. The whole family had to go to bed at a set time every night and get up at a set time every morning. We all had to be fully dressed for the day before we ate breakfast. We all had to sit down at a properly set table three times a day, and we all had to eat what was served on that table. Generally Grandpa would choose the menu for breakfast because he was the first one up. If he decided he wanted oatmeal, then everyone ate oatmeal; if he decided he wanted pancakes, then everyone ate pancakes; whether he selected sorghum, honey, or molasses as the sweetener, all were required to accept his choice. We were allowed no say in the matter. In addition, to reinforce the principle of “Waste not, want not,” we were required to eat everything on our plates. If we didn’t, the food was set aside and served to us at the next meal. Generally, unless it was a Saturday and we had cousins visiting, there was no eating between meals. Through this regimentation, the austere habits that Grandma and Grandpa had adopted and lived by for decades were imposed on us with a vengeance. And we often resented their severity. To be fair, I must note that it was those habits that made it possible for them to acquire four debt-free farms by the time we came to live with them. Now, there’s an achievement not to be overlooked. Nonetheless, Grandma and Grandpa were what the locals called “land-poor”—people who owned a lot of land but had very little money. And even what little they had they tried to save. The only things they spent money on were tea, coffee, sugar, salt, white flour, cloth, and kerosene. Years later I came to understand that there was a good reason for them to want to save money. They needed it to pay the taxes on their farms, three of which they had rented out to the families of their daughters. Due to the deepening Depression, they could never be sure if the rent would actually be paid. If the rent did not come in, there would be no money to pay the taxes and the farms would be lost. We children sensed, but could not really understand, the awful threat of that disastrous economy. I had to grow to adulthood before I could even begin to comprehend the impact of what was happening in those days—the disappearance of money and jobs, the loss of machinery and farms, the bank failures that took people’s entire savings. Though we didn’t understand them, we children were seldom protected from the harsh realities of the period, and we certainly sensed that something terrible was happening. Indelibly stamped in my memory is the scene in my Aunt Hazel and Uncle Ernest’s farm kitchen one wintry March morning when I was perhaps six years old. There I entered to find all the stalwart adults of my world—Grandma, Grandpa, Mama, my aunt and uncle—still and wordless as statues. It was clear that they had been crying. I had never seen adults cry. I didn’t know they could cry. I was struck mute with a fear that grabbed me right in the guts. Though I was given no explanation at the time, in the days that followed I overheard enough to realize that Grandpa’s brother and sister had each lost their farm, all of their machinery and all of their livestock, for reasons that were unfathomable to me. What can a child know of vast economic forces operating on a global level? I was stunned and afraid. 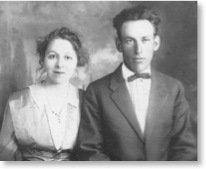 Grandma and Grandpa’s lives were changed forever by the plunging economy. It has taken me a lifetime to realize that the Depression and its consequent tragedies were nearly as incomprehensible to the adults as they were to us children. Since they could not understand what was happening in the world, how could they explain the situation to us? Suddenly, unexpectedly, a family of five was now the responsibility of two old people who had thought they were heading into a comfortable, if frugal, retirement. They must have been scared to death. In Garrison, then, we children were required to adhere to the rigid routines set down for us by Grandma and Grandpa. But our lives changed radically when the school year ended around mid-May, for that was when we left Garrison for the country. The move to the country provided our little family with a welcome separation from our grandparents, and them with a no doubt equally welcome respite from us. The farm we lived on was directly across the road from the farm where Mama’s sister, Aunt Hazel, her husband, Uncle Ernest, and their three sons lived. Unusual in Iowa, this proximity meant that there was much sharing and interaction between the two families. Feeling equally at home at both places, we cousins shared pets, leisure time, food, and chores. Indeed, the two properties were treated as one cooperative, if complicated, venture, though we maintained strictly separate households for eating, sleeping, and gardening. Each farm had its advantages. Aunt Hazel and Uncle Ernest’s farm was equipped with all the necessary implements, the buildings were properly maintained, and the livestock were well housed in winter and in summer; but it had insufficient pastureland. Our place was older, and the house, the sheep shed, and the chicken houses were the only buildings habitable the year round. The ancient, though picturesque, barn had been allowed to fall into a state of disrepair, and provided proper shelter for horses, calves, chickens, ducks, and geese only during the mild months of summer and fall. However, the permanent and best pastures were on our side of the road. Grandma and Grandpa visited the farms frequently in their very noisy Buick bringing food, household necessities, and goodies. On these visits they would stay the day, lending a hand wherever help was needed, and then return to their home in the evening. They did this for all four of their daughters and their families. It is no exaggeration to say that Grandpa and Grandma were about as compatible as two people could possibly be. They seldom argued; they went everywhere and did everything together. However, there was one event—involving a gun—that must be chronicled, an event that was revived, relived, and recounted repeatedly during the time our family lived with them. It happened when they were young parents and lived on the farm that later came to be occupied by Aunt Hazel and Uncle Ernest. In those days guns were a part of farm life. Women as well as men learned to shoot. Every family owned at least three guns: a .22 rifle, and ten- and twelve-gauge shotguns. From early childhood we were taught to respect and care for guns. “The most dangerous gun,” we were cautioned, “is the one that isn’t loaded.” That expression was drilled into us for reasons you will soon understand. One winter day Grandpa was in the kitchen cleaning his guns and Grandma was upstairs making beds. Grandpa accidentally discharged his “unloaded” gun. Grandma started screaming. Grandpa ran from the kitchen and started running up the steep stairs just as Grandma started to run down. They slammed into each other on the landing at the right-angled turn of the stairs, connecting with such force that they knocked each other to the floor, whereupon, in their panic, they began to shout at each other. No matter how many times they told the story, they still couldn’t get over the fact that they had erupted in such outbursts. “Why did you yell?” Grandpa would ask Grandma at the conclusion of yet another retelling of the event. They rehearsed this frightening event so often and vividly that I sometimes believed I was there to witness the incident. They were never able to get beyond their fright for each other’s wellbeing, nor were they ever able to see the burlesque humor in this event, which so entertained us grandchildren. Though there was a real possibility that the shot could have penetrated the ceiling and entered the bedroom, it turned out that it had lodged itself harmlessly in the doorsill between the kitchen and the living room. Curiously, Grandpa, who was so meticulous about everything, never repaired that doorsill. Our move to the farm when school let out meant that the rigidly ordered lives dictated by our grandparents were now governed by an entirely different set of expectations: our mother’s. Even though we had many more chores and responsibilities such as taking care of the livestock, preparing meals, and planting and tending gardens, we actually felt freer on the farm than in Garrison. In important ways our lives were more our own, and Mama often addressed and treated us as if we were adults—if only because she needed us to be. We four children were almost too much for our mother. To a surprising extent, she simply let us go our own ways. She didn’t mind when we went to bed or rose in the morning, if it was not a school day. She didn’t care what, when, or if we ate. She didn’t object if, in my nightgown, I trotted out to the henhouse to gather a couple of eggs and then, still in my nightgown, cooked a fried egg breakfast and ate it sitting outside on the sunny cellar door with my favorite cat. She ignored the niceties of setting places at mealtimes. Instead, she simply placed the food and utensils in the middle of the table and let us serve ourselves. Mama almost never made an attempt to serve a balanced meal. If she had just taken bread from the oven around the middle of the day, our noon meal would consist of freshly made bread, homemade butter, whole plum jam, and a huge pitcher of milk. If, in the garden, she noticed that the sweet corn was ready, we had nothing but buttered sweet corn for supper. Further, she didn’t insist that we all eat at the table or that we all eat at the same time. Of course, she did insist that we all do our assigned chores. Since it was obvious even to us children that it was necessary to meet our obligations to make the family operate, we seldom failed to do so, but we were allowed to create our own routines for our workdays—as did our mother, who had some very odd ideas about such matters. She marched to a different drummer, so to speak. Her priorities did not match those of most sensible people. One day she might iron or bake, even though the temperature had reached 95 degrees, on the grounds that she could not be made more uncomfortable than she already was. Yet the next day she might rise at dawn to start weeding in the garden because she liked the cool of the morning. The real surprise is that Mama was an indifferent homemaker. She could make great soup and bake superb cakes and pies, but she could never cook meat nor fry potatoes to anyone’s liking. She would either overcook or undercook, over salt a dish or forget the salt altogether. At my brothers’ urging I gradually began taking over the everyday cooking for the family when I was not much more than eight years old. I apparently inherited a natural affinity for cooking from Grandma and, rather than feeling burdened by the responsibility, I felt honored. Throughout my life, my culinary skills have been a significant asset. With the wisdom of advancing age, I have lately come to believe that Mama acted as she did because she was crushed by the stigma of her broken home and overwhelmed by the never-ending burden of tending to and raising four active children. She coped the best she could, and certainly she had many gifts and talents. She loved being out-of-doors and could work for hours husking corn, shocking oats, and gardening. She had a remarkable rapport with animals, especially Grandpa’s favorite, the horse. And she could play the piano and sing. The chief effect Mama’s unconventional life practices had on us kids at the time was our keen awareness that other children did not live the way we did. Though the realization that we were just outside the mainstream of society sometimes made us uncomfortable, it also made us stronger and reinforced our feeling of independence. Mama’s loose routines also made us kids remarkably flexible in handling unforeseen events as we grew up. If things don’t go as planned, adapt to the new development and get on with your life. With all of her nonconforming lifestyle, Mama did some things spot-on. She was a tyrant when it came to learning, or anything else pertaining to school. She encouraged, nay, demanded, that we do our homework, that we do more in school than was asked of us, and that we participate in spelling, dramatic, and music (both voice and instrumental) competitions—though she rarely attended the plays, concerts, or other contests that we competed in. She was, in fact, quite reclusive. Her parental involvement was almost completely behind the scenes. However, for my lifelong pursuit of learning, and appreciation of music, I owe her big-time. Beyond her, I owe these gifts to my grandfather, because it was he who had recognized similar gifts in my mother and encouraged them to flourish. Petite and pretty, studious and possessed of an exceptional memory, Mama was Grandpa’s favorite child. (Grandma repeatedly sniffed that he had always babied her.) In an extraordinary move for a farmer, Grandpa had enrolled her and her sister Hazel at Tilford Academy in Vinton after graduation from eighth grade, because he wanted his daughters to continue their education and there was no high school in the area. When they graduated from the academy (the school he himself had attended as a boy), he sent them on to Iowa State Normal School in Cedar Falls to earn their teacher’s certificates. Until her marriage, then, Mama taught at Monroe 6 in a one-room country school—the very one we would later attend. I never forgot this heroic example of unselfishness, and have used it to sustain me in making painful decisions when our family had to euthanize beloved pets. Don’t keep an animal alive because you can’t bear to suffer the pangs of bereavement. Think of the animal. This attitude makes the act bearable. Mama, Aunt Hazel, Uncle Ernest, Grandma, and Grandpa had a real gift for integrating us children into farm life. Working alongside us, they taught us how to perform the chores and execute the obligations that make a family and a farm work. Together we planted and tended gardens; harvested and canned fruits, vegetables, and meats; milked cows and fed calves; gathered nuts, morels, wild berries, grapes, and honey; cut wood; and harvested corn, hay, and soybeans. Thus we acquired an impressive store of what came to be identified as “assumed knowledge”—an education that is hard to match. We had the whole outdoors as our world during the summers, because we always spent them on the farm. And under Mama’s lenient, perhaps even negligent dominion, we kids felt unburdened. We were relieved of the disapproving and critical presence of our grandparents (though not one of us would ever have put it that way, for we respected them mightily). Despite the heavy responsibilities we bore, summers were the time we relaxed and felt appreciated. Winters under the eyes of our grandparents were much harder.